Bermuda is known for its pink coral beaches. Yes! Bermuda can be posh or affordable. Here's the best of where to stay and what to do to enjoy this Atlantic island paradise. The sweet snapshot on my mantle evokes memories of a dreamy honeymoon. Smiling in front of a moongate, there's Ken, with a headful of curls, sporting Bermuda shorts and knee socks, and me, with a fall flipped '60s style, wearing tangerine capris and a sleeveless turtleneck. We'd bought a cheap package holiday without a penny to spare. But things didn't turn out exactly as we'd planned. So young and naïve then, we chalked it up to experience. Forget smooching in front of an ocean sunset at Elbow Beach: the only view we had was of a rooftop incinerator. Our first day there, I had a stunning motorbike accident. A freak flat tire on the causeway sent me and my moped skyward for a loop. Luckily, we landed right-side up smack between the spokes of the bridge, with no injuries. I hitched a ride back to the resort with a truck driver who let me squeeze in among his load of pungent Bermuda onions. If not for our meal plan, we'd have dined on love alone. Literally out of cash in those pre-chargex days, we sheepishly snuck past the bellhop. On the flight home, we vowed to return when we could afford to leave a tip. Thirty years later, we indulged in a second honeymoon - this time, mixing luxury and economy. Ken's curls are gone, as are my curves, but the island remains as wonderful as we remembered it. Better still, we're pleased to report that, contrary to its posh reputation, Bermuda is affordable at last. 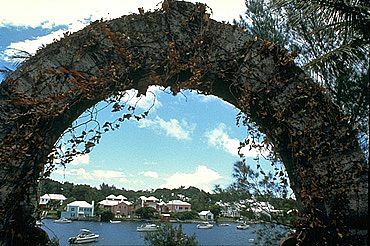 View of Bermuda’s tiny islands through a moongate. Situated about 1000 km off the coast of North Carolina, this elegant British Dependent Territory is actually a narrow chain of some 180 isles, most of them uninhabited. There's no visible poverty here - Bermudians enjoy very comfortable incomes. Houses are picture-perfect, with sherbet facades and white limestone roofs. 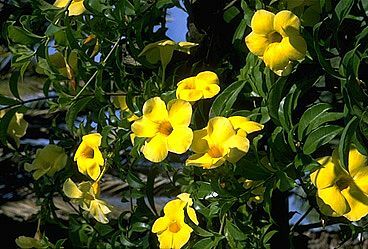 Wild bougainvillea, hibiscus, oleander and morning glory perfume the air. The beaches are gorgeous, from intimate coves to long swaths of pink sand. And the wide variety of hotels and eateries suits tastes from the simple to the sublime. Despite apprehensions of staying in our first island "housekeeping cottage", Angel's Grotto turned out to be a gem. The secluded string of whitewashed cottages was an easy 10-minute walk from a beautiful sandy beach. We felt deliciously bohemian in our top-floor efficiency unit, with its tidy parlor, kitchenette, king-size bedroom, and private bathroom. Daisy, proprietor of this award-winning hostelry, noted its popularity with professionals on post-seminar holidays. She's quite popular herself, perhaps because she arranges for her guests to play the prestigious, private Mid-Ocean Golf Club. The cash we saved by staying at Angel's Grotto covered our island escapades plus one sensational dinner at Fourways Inn, arguably Bermuda's best restaurant. Surrounded by the muted elegance of chandeliers, rustic beams, monogrammed silver and piano serenade, we dined splendidly, starting with Bermuda seafood chowder laced with rum and sherry peppers, and ending with plump, sweet souffles. A couple of days later we returned to the Elbow Beach Resort. Contrary to the saying "you can never go back", we found it romantic to revisit the scene of our honeymoon - especially since we upgraded to a divine lanai suite shaded by palms in a lush manicured garden, steps away from the pink sandy beach. This resort, too, turned out affordable, because we'd booked an air-hotel charter package through a travel agent. There are deals to be had in Bermuda, even at luxury resorts. The trick is to book charter packages that include airfare, accommodations, transfers, hotel taxes and service charges. Some even offer breakfast and golf privileges. These resorts - which may be booked individually - often appear in charter packages. 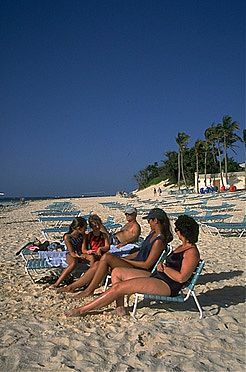 (In Canada, check out Air Canada Vacations' brochure.) The rates noted below run from April to November. Fall and winter rates are considerably lower. Check your local travel agent for best current rates. Elbow Beach. This luxury resort overlooking 50 acres of botanical gardens, has hotel rooms and suites plus lanais. 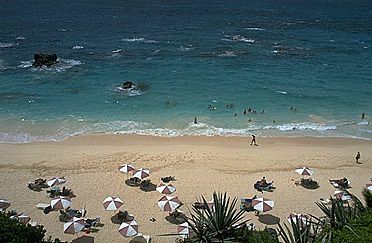 It also offers a magnificent pink sandy beach, huge pool, spa, five tennis courts, and several restaurants. P.O.Box HM 455, Hamilton HM BX Bermuda. POBox PG 299, Paget PG BX, Bermuda. rally near Long Beach Bay. Angel's Grotto. This cozy self-catering complex, just a short walk from the beach, has private access for swimming and snorkeling near the reefs in Harrington Sound. Guests can also visit the famed Mid-Ocean Golf Club. Rates: from $140 for 1-bedroom; from $225 for cottage which sleeps up to eight. P.O. Box HS 81, Smith's HS BX, Bermuda. Astwood Cove. Set in pretty surroundings with a view of a park and citrus orchards, the tidy apartments have kitchenettes and showers but no tubs. Guests use the nearby Mermaid Beach Club. Rates: from $120 for apartment and $225 for cottage per night. 49 South Road, Warwick WK 07 Bermuda. Monro Cottages. This seaside resort of self-catering cottages borders tennis courts and the Port Royal Golf Course (argued by some to be Bermuda's best), and overlooks its own private beach. Rates: from $200 per night. POBox SN 99, Southampton SN BX Bermuda. Oxford House: Proprietor Ann Smith has decorated this award-winning12-room guest house with English antiques, oriental rugs, and pretty chintz. Although it lacks a pool, it's well-located near Hamilton restaurants, shops and the local bus to the beach. Rates: from $155 per night, with continental breakfast. POBox HM 374, Hamilton HM BX, Bermuda. Royal Palms Hotel & Restaurant: This lively small hotel, once an estate home, is within walking distance of Hamilton. It boasts pretty Bermudian architecture, individually-decorated rooms (some with kitchenettes), a pool and the popular Ascot's Restaurant. Rates: from $170 per night, with breakfast. P.O.Box HM 499 Hamilton HM CX, Bermuda. Tel/Fax: USA: 800- 799-0824, 441-292-1854/1946. Wild bougainvillea line the roadsides. Huddled around a tranquil garden with a private pool, Fourways Inn is the queen of Bermuda's cottage colonies, with a guest list that includes Queen Elizabeth and Prince Philip. The Inn has garnered every top hospitality industry award for its sumptuous suites with private patios, kitchenettes, sitting rooms and fancy marble bathrooms. It's also the site of the superb Fourways Inn Restaurant. Rates: from about $230 per night, for two, including continental breakfast. P.O. Box PG 294, Paget PG BX, Bermuda. Cambridge Beaches. Bermuda's original cottage colony is where John Lennon wrote his Double Fantasy album, and David Bowie hung out at the bar. The resort's resident snorkeling and diving expert leads underwater photography expeditions to the spectacular Eastern Blue Cut Reefs. Located on a peninsula surrounded by beaches, the resort features a spa with indoor pools, tennis, croquet, a putting green and "introductions" to all private golf courses. Rates: from $380 single or $420 double,with breakfast and dinner. Phone: 800-468-7300 / 234-0331. Fax: 441-234-3352. The Reefs. Beautifully located on a high cliff overlooking its private beach, the Reefs has rooms and cottages terraced into the cliff. Rates: from $196. per person with breakfast and dinner. 56 South Road, Southampton, SN 02, Bermuda. Ariel Sands Resort. This exclusive, 1950s cottage colony was recently bought and renovated by Michael Douglas. It has a retro '50s decor loaded with the star's movie memorabilia, a fancy spa, two pools, a private beach, tennis court, putting green and gourmet restaurant. Rate, including breakfast and dinner: from about $290 for room with breakfast; suites from $460; cottages from $770. P.O.Box HM 334, Hamilton, HM BX, Bermuda. 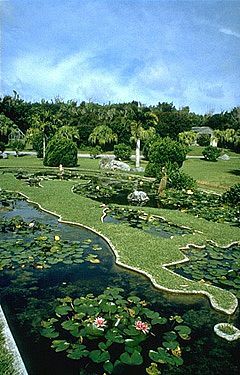 A garden with lily ponds at the Gibbons Estate depicts a map of Bermuda. Scooting around the island on moped, beach hopping, hiking along old converted railway trails, horseback riding along the dunes, sailing, sport fishing, scuba diving, snorkeling around the reefs and golf are favorite island pastimes. 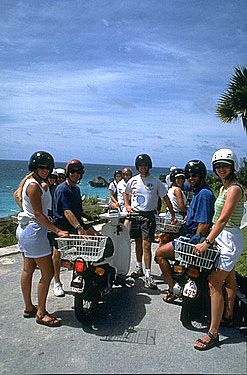 Getting around: There are no rental cars available in Bermuda, so tourists get around by mopeds, taxis or buses (individual fares are $2.50; 15 tickets cost $15). Biking is another option. A word of caution: Pack your own helmet, or rent a motorcycle helmet. Driving is on the left side of the road. You can rent bikes from Eve Cycles (tel: 441-236-6247) or Oleander Cycles (tel: 441-236-5235) or Wheels Cycle (tel: 441-292-2245) for about $25 per half-day. Capital appeal: Hamilton, the picturesque harborfront capital of Bermuda, is easily explored on foot. Local maps denote buildings of significant architecture: City Hall, Sessions House, Secretariat, Bermuda Historical Society. Water world: The $21 million Bermuda Underwater Exploration Institute is the world's first scientific institute to focus entirely on deepwater exploration and research. Among the fascinating exhibits: a ponderous 1900s diving suit and a series of shrunken human heads showing the gruesome effects of deepwater pressure. A demonstration of dive technology shows how the bends, pain and even death are caused by nitrogennarosis when divers decompress too fast. The magnificent shell collection is arguably the world's best. You can even ride the world's first simulated "deepwater submersible" down to the 12,500 foot base of the Bermuda Sea Mount. History lesson: St. George's Town, where Bermuda's original settlers were shipwrecked in 1609, encompasses the historic Town Hall in King's Square with its wooden racks for doling out punishment; a warren of delightful shops; St. Peter's Church (the world's oldest continuously used Anglican Church, circa 1612); and impressive Fort St. Catherine, which proved useless since the point of land was buffered by perilous reefs. The Royal Navy Dockyard was once the strategic outpost of Britain's Royal Navy, dubbed "Gibraltar of the West." Accessible by bus or ferry ($3.75), it houses nautical museums, the Arts Center, the Bermuda Craft Market and a slew of tourist shops. Ocean playground: A mecca snorkeling and scuba diving, Bermuda's waters thrive with brilliant fish swimming through gardens of sea fans and anemones. While snorkeling is sensational at Church Bay, Dockyard Bay and Tobacco Bay, adventurous types may prefer tailing barracuda through the labyrinths of masts and hulls of the 400 shipwrecks, some dating to the 15th century. Guided sea excursions (with short lessons) for snorkeling, scuba diving and other watersports are easily arranged through any hotel concierge. Sail away: To rent sailboats or small crafts, call Salt Kettle Yacht Charters (tel: 441-236-4863), Mangrove Marina (tel: 441-234-0914), or the Bermuda Canoe Association (tel: 441-234-2328). Kayaks or canoes cost $15 to $20 per hour. A word of caution to solo sailors: stay within the protected waters of Great Sound, lest you enter the Bermuda Triangle…. Horsing around: For horseback riding, call Spicelands Riding Centre (tel: 441-238-8212). Breakfast plus a 90-minute ride costs aout $45. Fun with Flipper: Dolphin's Quest, operating out of the Marine Museum at the Royal Naval Dockyard, is the place for face to face encounters with live dolphins. Educational and interactive programs are available for adults and children over 5 years old. Contact Bermuda (1-800-Bermuda) for current details. Tee time: Bermuda is a golf paradise with emerald fairways to suit every taste and level of play. To avoid disappointment, book tee times before you arrive. For details, call (800)Bermuda. Bermuda weather: The temperature averages a humid 84'F in summer, and a comfortable 68'F in winter. April, May are delightful. December and January are good for golf. March can be unpredictably rainy. The Bermuda dollar is pegged to the U.S. dollar which is accepted everywhere. Don't forget: sunscreen, beach mats or towels, portable umbrellas or tents to shade babies. Toby Saltzman is an award-winning travel writer and photographer. She is publisher and editor of www.travelterrific.com.